The Rebel Sweetheart. : Pucker Up! 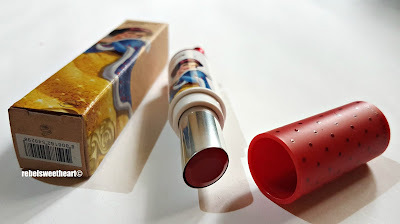 | The Face Shop x Disney Princess Moisture Touch Lipstick. Pucker Up! 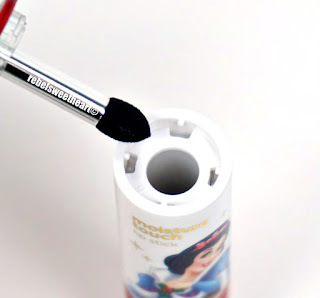 | The Face Shop x Disney Princess Moisture Touch Lipstick. I hope you're all enjoying the long weekend, which also happens to be the last weekend of June. It's also the final week of my son's (extended) school break. Next Monday we go back to the school and I go back to the daily grind - homework, quizzes, projects, you know the drill. 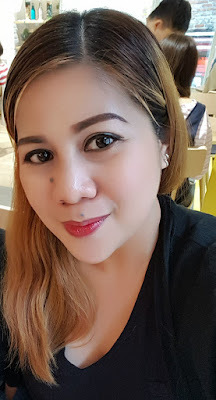 And this is why I'm trying to catch up on my blog backlogs - I still have tons of makeup and skincare products that I need to review and write about, and I can only do so much when Yue goes back to school. 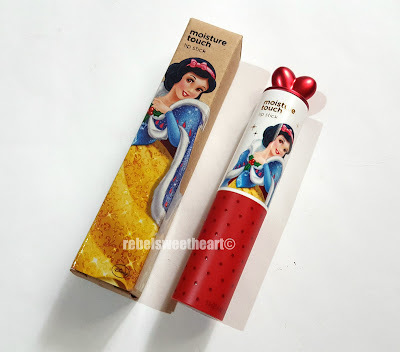 Anyhoo, let's cross one more item in my 'to-blog' list - the Moisture Touch Lipstick from The Face Shop x Disney Princess collaboration collection. Released in December 2016, this limited edition holiday collection includes lipsticks, lip tints, eyeshadow palettes, sheet masks, nail polishes, and even a foot mask featuring Disney princesses in the packaging. I bought a few sheet masks and lip tints as Christmas gifts for my friends; for myself, I got this Moisture Touch Lipstick because the packaging is too pretty to resist. Also, it was on sale at just 6500 won (around Php 300 or $5) - almost half of its original price. Haha! 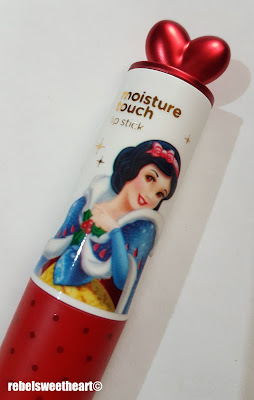 The Face Shop x Disney Princess Moisture Touch Lipstick. It comes in a cardboard box with Snow White's picture on it. The lipstick itself also has Snow White's picture on it, with a dainty red heart on the cap. I was so overwhelmed by the cuteness that I wanted to buy all three lipsticks from the collection, but alas, Ariel from The Little Mermaid was a bit too orange-y for my taste, while Rapunzel from Tangled was out of stock. Product description (in Hangul) at the back of the box. Product description (in English) on the side panel. This moisture lipstick contains serum that coats the lips to create vivid, glossy color while providing moisturizing and hydrating care. Dainty little heart on top. The serum mentioned is actually olive-derived squalene, which has moisturizing and anti-aging properties. That being said, the Moisture Touch Lipstick has an incredibly rich, cushioning, and hydrating gel-like formulation. 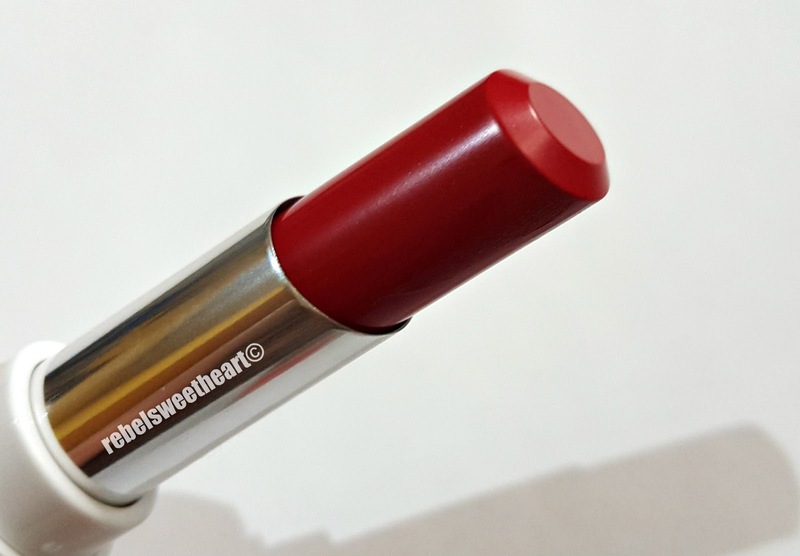 It has a soft, creamy texture and glides on the lips smoothly without tugging. Its moisturizing effect makes it very comfortable to wear and leaves your lips feeling like it's drenched in lip balm, even if you're not wearing lip balm underneath. It's highly pigmented too, and the vibrant, buildable color lasts on the lips for about four or five hours. 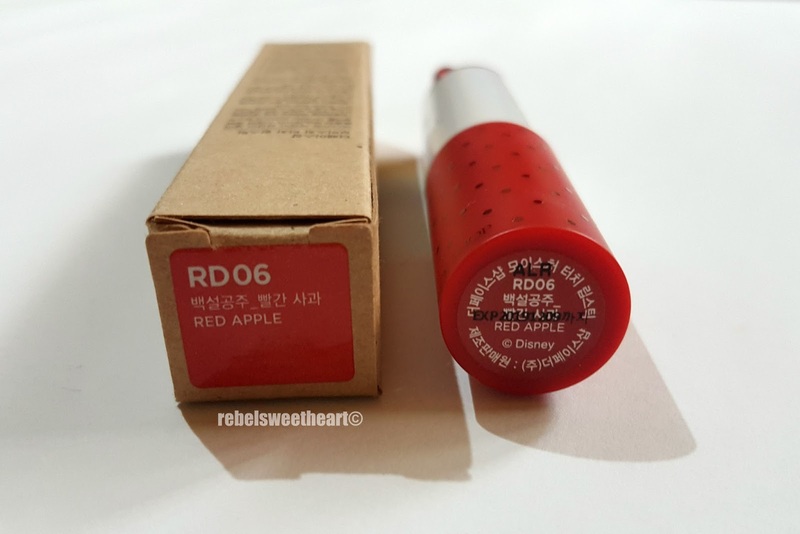 RD 06 is a brightened, medium red which flatters most skin tones. RD 06 Red Apple when worn. 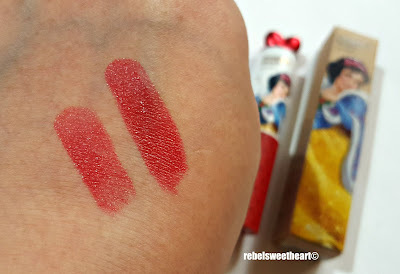 If you're into the gradient lip trend, which is extremely popular in South Korea, you can achieve the look by 'smudging' the color on your lips using the applicator underneath the heart. This was an accidental discovery; I twisted the heart out of curiosity and voila, there was actually an applicator hiding inside it. Twist the heart to reveal the surprise! LIPS: The Face Shop x Disney Moisture Touch Lipstick in RD 06 Red Apple. Oh my goodness how cute! 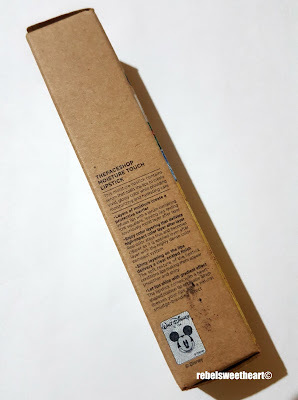 I love the packaging, love Disney! The color looks great and long lasting. ooh! I love the pretty box it comes in! 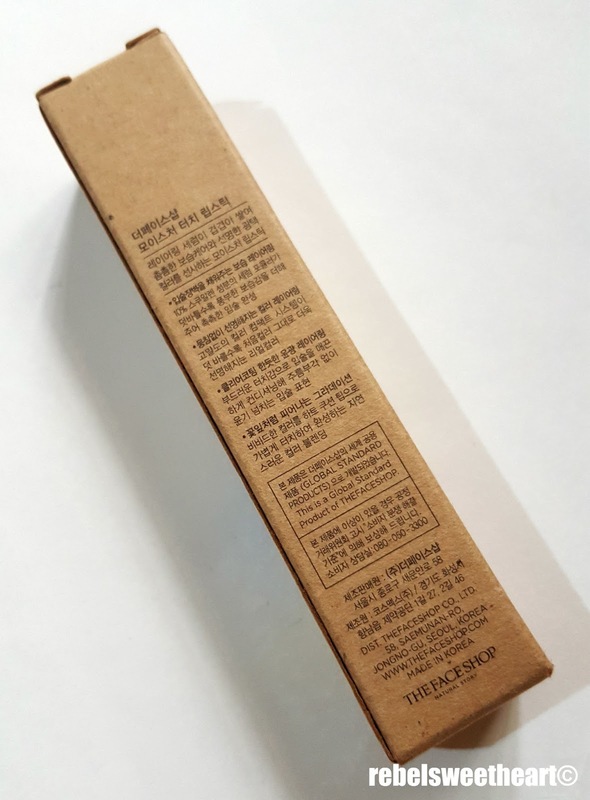 I definitely think packaging makes a huge difference when it comes to products! This color looks great on you! I like it! I love moisturizing lipstick. The color is one of my favorite shade also. I am totally love this! OMG Snow White, my girls will love that! I'll try to look for Rapunzel's, shame that it wasn't available. OMG I LOVE THIS!!!! Disney makeup is my favorite whenever and wherever! It looks awesome on you, but I think I'd be better off with something lighter. I love this! The packaging is so unique. I am going to get a stash of these moisturizing lipsticks and use them as Christmas stocking stuffers for my nieces. They will love this!